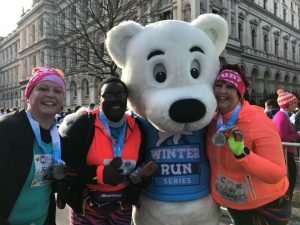 My first ever 10K race was on the mean streets of London back in 2006, so whenever I get an opportunity to reenact that I take it…especially if it involves novelty winter characters like the Winter Run Series races do. I did my first Winter Run in 2015 and fell in love…each year I enjoy it more and more. 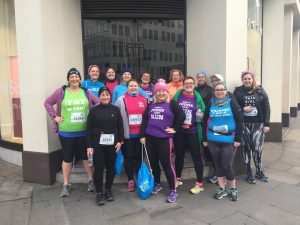 My alarm went off at 7.30am…which makes me feel a bit guilty, because I know some of my Clubhouse ladies were getting up at 3am to get into London, or had come the night before. I was a bit apprehensive making my way into Central London because I have been injured. I have had something going on with my feet for about 3 weeks now. 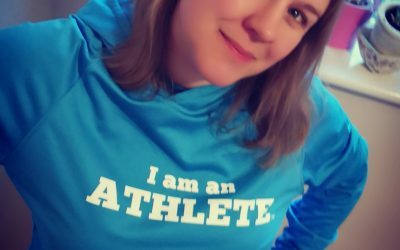 I’ve been to all kinds of specialists and have been doing lots of feet stretching and manipulating…not to mention the purchasing of 3 new pairs of running shoes. 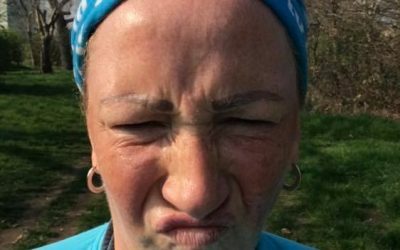 I did parkrun on Saturday to see how it all felt…and although my feet felt weird, there was no pain….but then on the way home from the cinema that evening my knee started doing this weird thing. I hate when my body doesn’t want to play ball. This time last year I went into the Winter Run in great shape, as I had been focussing on my speed using my “Scream if you want to run faster” principles from my book and online programme…which paid off as I finished with a PB over the course of 1 hour 12 minutes and 11 seconds. This time my goal was simply to get round in one piece. I knew there would be walking…and that was OK with me. 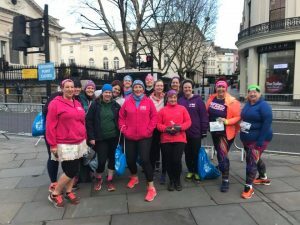 I had a bunch of women taking part from my online running club, The Clubhouse meeting opposite Charing Cross at 8.30…it was a lovely meet up, always great to meet women in the flesh. It was bloody cold though. I think that is what makes this race though, the winter theme does bring something unique, and even though it is a massive event with tens of thousands of participants, the staggered starts make it quite relaxed in terms of bag drops, toilets and the start…we literally didn’t hang around at all, moving forward towards the startline bit by bit. My plan was to run as steady as I could and just see what happened. I knew I was running much slower than I am capable off, but I hadn’t covered 10K in like 3 and a half weeks so it was all so unknown. Although because of this speed thing I found it really hard to keep warm, I had a hat but no gloves, so the first 3K seemed quite challenging…it shouldn’t have been so labored. The atmosphere was brilliant though…I loved the Yetis…which I think perhaps were a new addition. I reached the half way point in 38 minutes, the same time as my parkrun the previous day, but 3 whole minutes slower than last year…which on reflection wasn’t bad. At around 7K though things became really difficult. My feet were hurting on each step…it is a weird pain to describe, almost like the pain you get in the ball of your foot when you wear high heels for too long. My knee went a few times too. 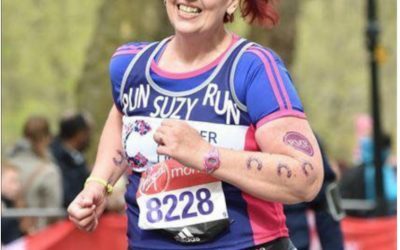 I felt like I was falling apart, but the support from the crowds and other runners was brilliant so I kept on forging ahead. I realised that actually, it hurt more to walk than to run, so just kept plodding. I was surprised when I hit the 9K mark, I felt surprisingly good. Fitness wise I feel like I am in great shape as I have been swimming loads recently, I just need to get these bloody feet sorted. I even managed to speed up in the final dash…it is hard not too with everyone cheering. I switched my watch off and made my way through the finish area feeling relieved that I had made it on one piece, with not too much trouble. The distance wasn’t a problem…and I didn’t feel like I was aggravating the problem in my feet. A text came through telling me I had finished in 1.26.20…I am super happy with that, especially seeing I ran more than 90% of it. Jo Roberts finished in 1.24, nearly 6 mins faster than 19th December and 9 mins faster than the week before that over the same distance. Finished in 1:15:53 I thought it was really well organised with great support. 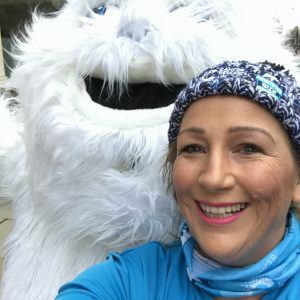 I would say this was my favourite 10k , I enjoyed it even more than Disney ? ?. 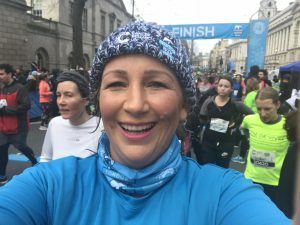 I think great friends, great crowds , great course & great organisation made it for me!” Finish time 1.44.33 – I swear I got goose bumps crossing the line hand in hand with Sue & Jeanette! ? ? 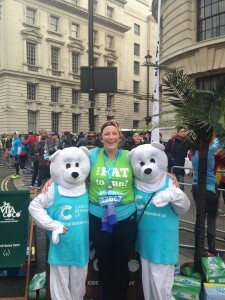 Stacey Taylor managed a new PB of 1:08:11. I love this race. So well organised, the course is great and the atmosphere is fab. I finished in 1hr 25mins. So much better than only a month ago when I did my first trail run. Loved the run-through the city- saw parts of it I had never been before. I did it in 1:28:03 which is about right for me. 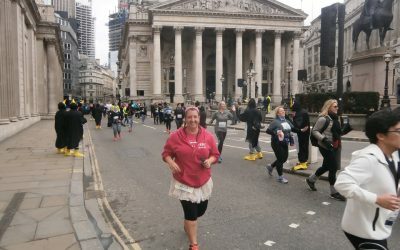 Enjoyed the whole experience – was using it as a test runexperience for London Marathon and so what I learned today was that I will need to remember to actually start my watch as I start (not 1km in) and to start my ASICS Run app a lot sooner than 5km in!!! ? ? 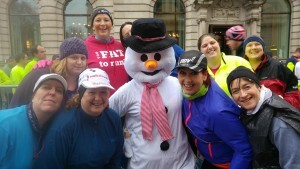 Me in 2015…there were TFTR ladies on the course, but we didn’t organise a meet up. 2016 and one of our first official race meet ups!!! The tribe is growing…all nicely kitted out too!!! On the train on the way home I realised how lucky I am to live in this city, to be a runner, to be in good health…even with my dodgy feet, which were now saying hello to the world in my flipflops which I had packed especially. 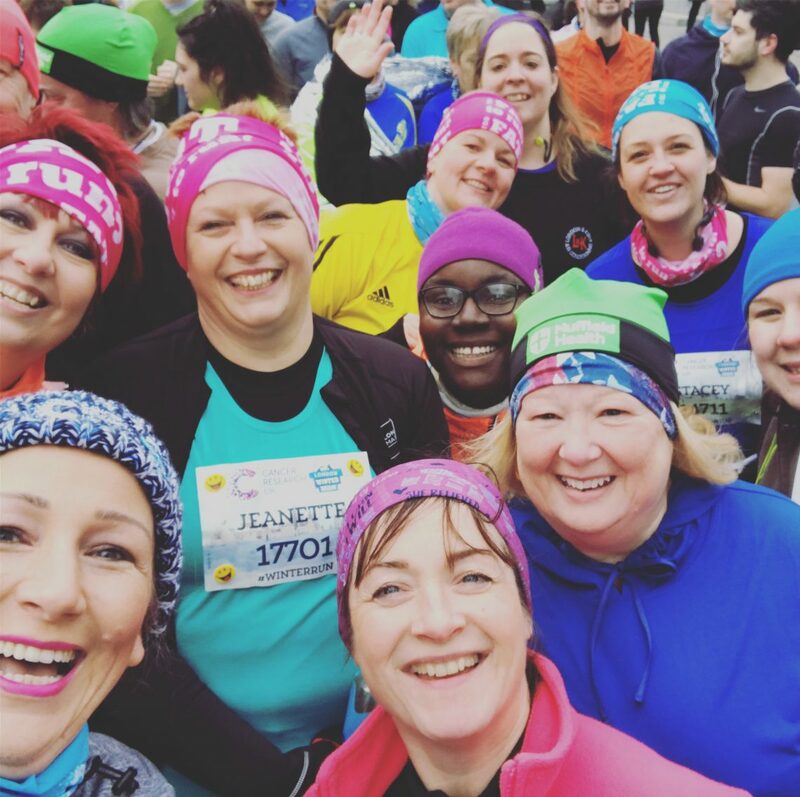 What a wonderful way to mark World Cancer Day, I know many thousands of pounds would have been raised for Cancer Research UK…and all while having fun and showing what we can all do.